After a couple of miss directions, (we went back up the mountain and back down again, when we turned around thinking we missed it we were only about a mile away) we finally made it to the RV Park. 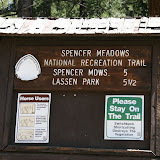 The park is a little rustic, but had a nice site with full hookups. 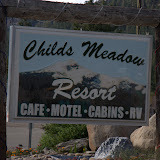 In addition to the RV sites, they have cabins, a restaurant, motel like rooms, large group cabins and a tenting area. We ate dinner in the restaurant last night, Friday, and the food was excellent, the service was good and people extremely friendly. While waiting on dinner there was a commotion outside, I got up and looked out the front window and found that across the street in the cow pasture a coyote was stalking a calf and momma was having none of that. The owner said that some people need TV to entertain them, all we have to do is sit outside and watch the action. Picture note: Click on the picture to load the album. The Album also has a slideshow button on the left and on the right side are little boxes you can click to increase or decrease the size of the pictures or just double click a picture and step through the pictures. Friday morning started off a lot like Thursday, except that Joshua and Peg slept in until after 9. Once everyone was up and those that needed it were fed, we started our day with what we thought would be a good slow walk for starters. There was a National Park trail 1/4 mile down the road that looked interesting. The sign did say it was a 5 mile hike but we thought, “This is the valley so it shouldn’t be too bad…. famous last words.” We did make it a little over a mile, all up hill, before we gave up. I say we in that Peg and I gave up and Joshua wanted to keep going. When we finally made it back to the truck, he did say we had done very good…for our age, thanks. We went back home, had lunch and rested for awhile. Then we decided we could do a nice moderate 30 minute climb to Bumpass Hell. 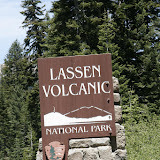 We drove back into the park and headed to the large parking area for Bumpass Hell. 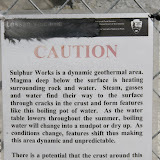 Everyone told us that it was well worth the trip, with sulfur vents, bubbling mud pots and boiling water. Ok, and as you can see in the slides that follow, the sign DOES say a 1.5 mile 30 MINUTE MODERATE walk. Right off the bat we were transversing snow, not too bad. After climbing over a large, slippery snow bank, we got held up for 20 minutes as they were doing trail work. The rangers working on the trail said that there was some more snow on the trail ahead but should not be a problem, just a little slow going. I had my new hiking boots on, Peg had her sneakers on and Josh had his new basketball shoes on, not the best footwear for this type walking, however they both said to continue and continue we did. After I almost fell three times and Peg did fall twice and over an hour of walking we finally got near enough to see the sulfur mud pits. Peg had had enough so Josh and I continued on, hindsight says I should have stopped also. On return to where we left Peg, she was not there, I was exhausted and no place to rest except on the snow. Joshua, bless him, volunteered to carry some of my gear and I just had to let him, that helped but I was still dragging it. We caught up with Peg and after another hour and a half we finally made it back to the truck. Never was I so happy to see a truck. When we got back to the camper, it was decided that cooking was out and we would go the additional 100 yards to the restaurant for dinner, very glad we did. One of the things that came out of all this hiking, Peg decided that hiling boots and hiking poles are a must. I guess the next stop will be at a shoe store for boots for her and Joshua. $$$$$, me and my bright ideas! Believe me, in the summer with no snow it might have been a 30 minute walk, but in the spring with a lot of snow on the ground —— STAY A HOME. After our experience on Friday, we took the day off from hiking. I worked on the pictures, Peg did laundry and Joshua played on the computer. Tonight we are not cooking either, but are going for prime rib at the restaurant. I had to add a little more about the RV resort. We just got back from another delightful meal, the owners and staff go out of their way to make you feel at home. If you don’t feel like one of the family, then it all your fault. If you are ever in this part of the state, be sure to stop in, if only for a meal, you will not be unhappy. Chcekout their website, it is very good. Until next time, may your days be filled with joy and happiness.